It's generally never good to be surprised by an airline. The unexpected news they deliver is almost always bad, whether it's to let you know your flight's been delayed or canceled, or that you're plane's being diverted to a different city due to someone's noxious dirty socks. However, JetBlue is gearing up to pull off a legitimately fun surprise in November, when it takes 100 people on an all-expenses paid volunteer trip to a mystery destination. 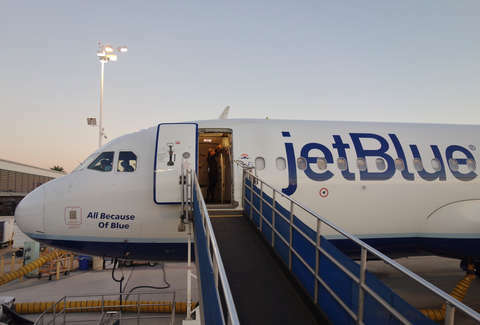 To celebrate what's dubbed the JetBlue Month For Good, the popular airline will fly 50 lucky people and their guests of choice on a free four-day volunteer service trip to an as-yet-undisclosed location. The excursion, which it's calling Destination Good, will bring the crew of do-gooders together with some of the airline's crew members and non-profit partners to participate in activities related to three core areas of service: youth and education, community, and the environment. However, the big twist is that whoever gets picked to go won't even know where they're going until the morning of the trip. The trip, which will run from November 27-30, leaves from New York's JFK Airport, and while the trip from there is totally free, whoever scores a spot to go will have to find their way to and from New York in order to participate. If you're down to put yourself in the running, you can either enter to win online or at temporary kiosks that will be popping up around NYC and LA in the next couple of weeks. And if you're one of the 50 people they select, you'll get a heads up by November 20 so you can tweak your schedule accordingly. Even if you don't manage to score a free seat out of town next month, you're not totally out of luck. JetBlue's latest flash sale has some seriously cheap flights up for grabs, which come with the added bonus of knowing where you're going ahead of time.